The Wall Street Journal's Jason Riley has penned an illuminating Op-Ed which eloquently describes the current strategy among Democrats following their unsuccessful attempt to dislodge newly minted Supreme Court Justice Brett Kavanaugh; smear the Supreme Court itself. Riley also wonders if the severe character assassination he suffered at the hands of Democrats "did not change" him, as he asserted in remarks following his confirmation - noting that "no one on the court, with the exception of Justice Clarence Thomas, has come close to being treated as horrifically as Justice Kavanaugh by the nomination process." Brett Kavanaugh endured a Supreme Court confirmation ordeal like no other. He’s now Justice Kavanaugh, but that doesn’t mean the Democrats are done with him. Or even close to being done with him. House Minority Leader Nancy Pelosi wants the Federal Bureau of Investigation report on sexual-assault allegations, heretofore seen only by senators and staff, made public. Rep. Jerry Nadler, who’s in line to become chairman of the Judiciary Committee, has vowed to reopen investigations into Justice Kavanaugh’s background if Democrats win control of the House next month. Democrats aren’t playing up talk of impeachment, but they haven’t ruled it out. Mr. Nadler knows that an attempt to remove a justice from the Supreme Court, which requires a two-thirds supermajority in the Senate, would almost certainly fail. And Mrs. Pelosi is well aware that there are very good reasons why FBI background checks are confidential. Information gathered could be sensitive or embarrassing; much of it is hearsay; and people are less likely to speak openly and honestly with investigators in the future if they have to worry about being publicly identified. So, is any of this going anywhere? Not likely, but that’s not the point of these exercises. The left is angry right now—bordering on unhinged—and Democrats hope stoking this rage will help get their voters to the polls on Nov. 6. The risk is that these continued attacks on Justice Kavanaugh’s character—and the promise of more to come—might also boost Republican turnout. When Senate Majority Leader Mitch McConnell thanked Democrats and left-wing activist for mobilizing Republican voters, he was being sincere. Since the hearings, whatever voter-enthusiasm edge Democrats previously enjoyed has all but disappeared. Republicans in the Trump era are divided on some issues, but putting conservatives on the Supreme Court isn’t one of them. If Democrats weren’t so busy blaming Hillary Clinton’s loss on the Russians, they might recall that Mr. Trump’s campaign promise to nominate judges in the mold of the late Justice Antonin Scalia went a long way toward unifying his Republican support. Having lost the fight over Brett Kavanaugh, Democrats quickly pivoted to attacking the Supreme Court as an institution. After the confirmation vote Saturday, Sen. Dianne Feinstein tweeted that his appointment “undermines the legitimacy of the Supreme Court.” Connecticut Sen. Richard Blumenthal, another Democrat on the Judiciary Committee, added: “The damage done today will be enduring—to the United States Supreme Court & to our country.” What’s next, encouraging citizens to disregard certain rulings by certain justices? Questioning the legitimacy of the court and undercutting confidence in the judicial branch is irresponsible and dangerous. The tactic recalls some of the ugliest periods in our nation’s history, and today it’s a mainstream Democratic talking point. At a swearing-in ceremony on Monday, the president apologized to the Kavanaugh family for the “terrible pain and suffering” they experienced in recent weeks. In his own remarks, Justice Kavanaugh said he had “no bitterness” and that the confirmation process “did not change me.” Conservatives are hoping that’s the case. 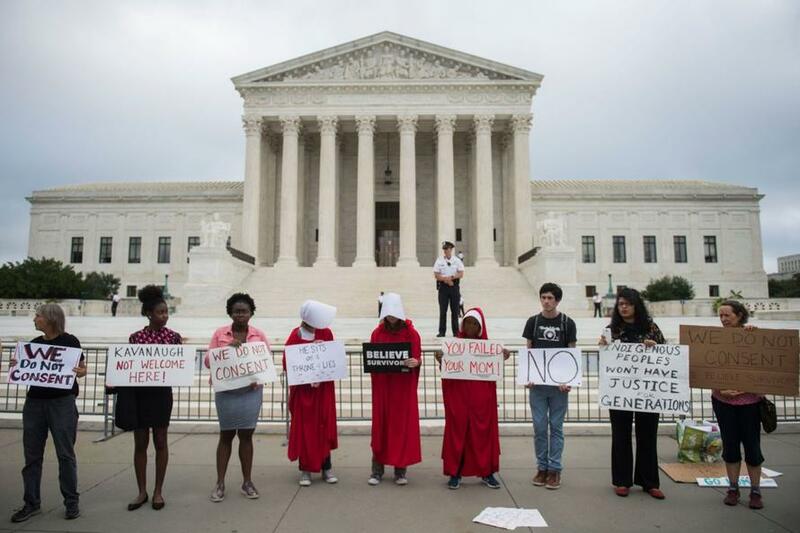 They’ve seen too many Republican-appointed justices over the decades—from Sandra Day O’Connor to Anthony Kennedy to David Souter—shift leftward on the bench or simply prove to be less than consistent conservatives. Nothing in Justice Kavanaugh’s academic writings or his more than 300 opinions as a federal judge gives his supporters reason to worry. But no one on the court, with the exception of Justice Clarence Thomas, has come close to being treated as horrifically as Justice Kavanaugh by the nomination process. Justice Kavanaugh may be a thoughtful jurist who is secure in his views about the law, but he’s also a human being. Democrats and the media portrayed him as a monstrous sexual predator, and it’s only natural that he would want to correct that view. Still, my guess is that Justice Kavanaugh won’t waste his time trying to win over people who dispensed with basic fairness, the presumption of innocence and the notion of due process in an effort to derail his nomination and advance a political agenda. He understands that people who were eager to believe decades-old allegations without any corroborating evidence or eyewitnesses are probably never going to be in his camp. He knows it’s useless to seek validation from mainstream news outlets that will persist in pretending that being accused of something is tantamount to being guilty of it. Those who were unpersuaded by a seventh FBI background check won’t be persuaded by an eighth, ninth or 10th one, either. Justice Thomas, who also faced false last-minute allegations during his nominating process, has spent more than a quarter-century on the court doing his job, staying true to his judicial principles, and not giving a damn what the Washington Post and CNN have to say about him. It’s unfortunate that the newest justice faces a similar task, but I’m guessing he’s up to it.